We were one of four architects invited to take part in this design competition for a new College building in 2004. The project has to reconcile two objectives which might seem to be in opposition to one another. It must maintain the privacy of garden spaces characteristic of this part of North Oxford and create a distinct identity and memorable image for the new, and in many ways, non-traditional college. 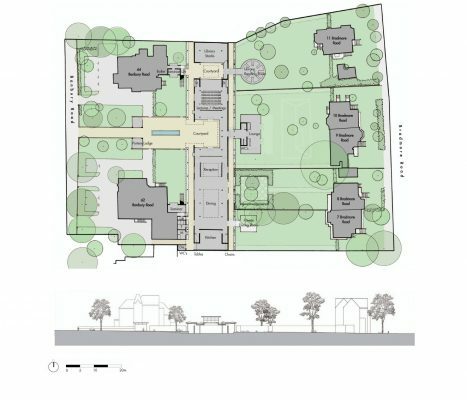 The genesis of our proposal lies in the idea of transforming the north/south garden wall which defines the boundary between the residential environment of Bradmore Roads and the teaching and research associated with the houses on Banbury Road into the new shared territory of the college. The wall divides and contains a building, over which, and within which, the gardens continue. • It has minimum impact on the existing garden environment. • The protective mass of structure, soil, planting and paving will stabilise the building’s internal environment, protecting it from solar gain in summer and providing insulation in winter. • It creates another world at the centre of the site. The entrance clearly signals the presence of Kellogg College from Banbury Road. It is inviting but slightly mysterious. The flanking walls of the forecourt allow glimpses but do not immediately disclose the extent of the college. 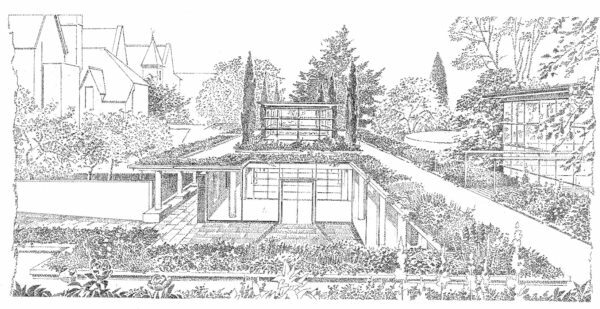 The college is discovered as a sequence of spaces between the existing gardens. The collective and social spaces, the reception room leading to the dining room, the lecture theatre and bar are linked by an ambulatory around the entrance court. This is an important social space for this new kind of college community and for conference delegates. It has formality and appropriate scale. 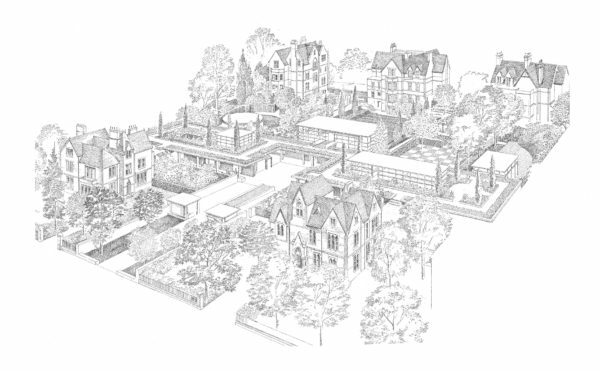 The scheme enhances rather than diminishes the identity of the existing gardens and houses. These are invitingly integrated into the new development by colonnades which connect with 62 and 64, Banbury Road and link to garden paths from the residences on Bradmore Road. Each of the gardens could have a special character, a series of quite different kinds of place discovered sequentially from the colonnaded walks; a cylindrical reading room, in a leafy glade, a pavilion like bar / lounge facing onto a croquet lawn, an open chessboard paved terrace for the refectory and perhaps a private dining room, in its own garden.